Stern College for Women's Studio Art program prides itself on its high-level professional courses and nurturing atmosphere that empower students to find their individual art voices. Our courses will give you the training you need to go into various art professions including but not limited to graphic design, art therapy, fine arts, fashion design, interior design and architecture. The student develops a Shaped Major based on her particular art interest. Students also may sign up for an 18-credit Art Minor. Furthermore, any Stern College student who wishes to explore her artistic side is welcome in our classes. Majors may take up to ten credits at the Fashion Institute of Technology (FIT), and minors may take five credits. For more information, contact Professor Traci Tullius at tullius@yu.edu . The mission of the Studio Art program is to provide our student artists with the conceptual and technical tools necessary to pursue and be competitive in a diverse array of careers within the realm of visual art including but not limited to graphic design, art therapy, fine arts, fashion design, interior design and architecture. 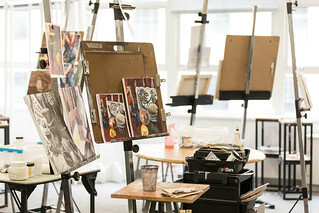 Studio Art majors will be able to apply visual communication skills and techniques appropriately to their specific area of emphasis. Studio Art majors will be able to express visual literacy and competency in the principles of drawing and design. Studio Art majors will be able to evaluate both their own work and the work of others using the language of art. Studio Art majors will be able to demonstrate personal visual style and artistic voice.